Why Do I Need A Roll Out Trundle Unit ? If you currently have a daybed frame with link-spring and would like to add additional sleeping space to your child’s room or a guest bedroom, then a popup trundle unit is the perfect solution. Perhaps you’ve recently moved and yours was lost or damaged.Whether replacing or adding one to your existing bed, STL Beds has your solution. Glideaways roll out unit stows underneath any type of daybed whether it be constructed of wood, iron, or any other kind of metal. It’s strong, easy to operate, and offers perfect support for your current mattress. Glideaway’s roll out trundle unit is built with your family and friends safety in mind. Helically suspended link surface supplies your mattress with even firm support. Dual 3/4″ x 3/4″ cross bars for added center support. Sides rails help to retain mattress and keep from sliding out of position. 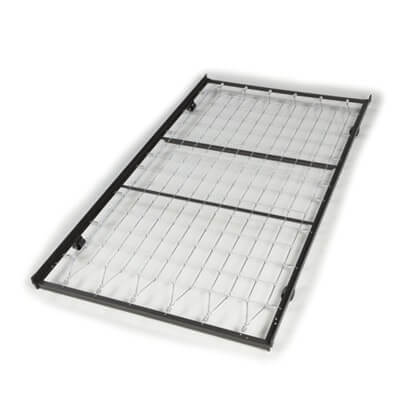 This unit is a rollout trundle with tension springs that can be stored under your daybed when not in use. This rollout trundle bed can turn any day bed into an additional twin-sized bed by adding a mattress to the trundle unit. (mattress sold seperately).